Every day we use many online services, such as net banking, e-mails, and online shopping portals to name a few. Remembering different passwords for different services is not an easy task. And, if you use one password for all then your credentials may fall into the hands of web criminals and exposed to tremendous risk if they are hacked. This is where a password management software becomes useful. It stores the password for each site you use so that you don’t have to remember a long list of passwords. You just need to set one master password to open the software, and the rest is done automatically. We have compiled a list of some of the best password management software in the market right now along with their key features. We hope this list will enable you to make an informed decision about which one suits your needs best. 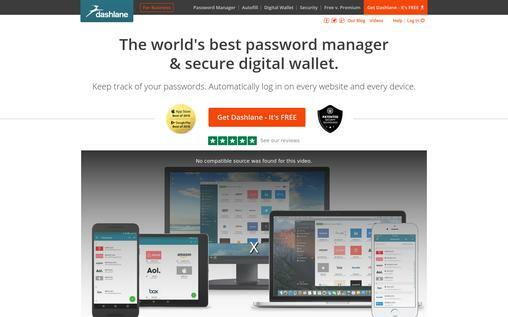 Dashlane is one of the best in the field of password management. It automatically imports your password from any web browser into your password vault. It also makes new password right within your browser and saves any missing password as you browse. With the auto-login, you never have to type any password again. With the free password manager, get automatic login for all your accounts. You can change the passwords of all your favorite sites with just one click. Your weak passwords are changed online, saved in Dashlane and available on all your devices. Get the health details of your password in the security dashboard. Identify the reused or weak passwords, stored in your password vault. Get security alerts to your device, if any of your accounts is compromised. Generate a strong new password with password generator and save them to your password vault. Keep your sensitive data in the secure notes which is accessible to you only. Encrypt and share passwords with others. You can manage shared access and sync updates between you and those with whom you shared with. It offers Android and iOS app to manage your passwords on any device. It costs $39.99 per year (can be used on unlimited devices) with 30 days money back guarantee. 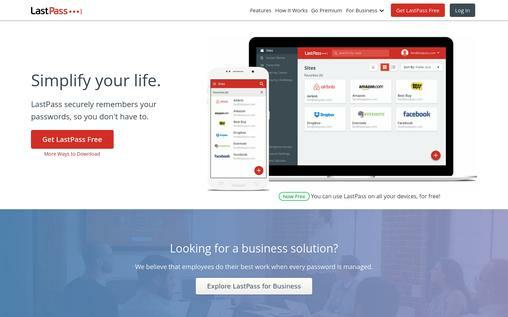 LastPass offers the best way to manage passwords; you just need to remember the master password and LastPass remember the rest. It automatically sets a 12 character random password composed of letters, numbers and special characters, for all the login credentials used through it. A user can also sync all their devices for free. Store all your passwords and notes in a secure vault that can be accessed from any device and is backed up and synced automatically wherever you need it. You need to save passwords only once as you browse and LastPass autofill the login for next time. The Secure Note allows you to save important information in a password encrypted notepad. You can save unlimited logins of same websites and easily switch between them. Find weak, old, duplicate and vulnerable password and change them by generating a stronger password with built-in password generator. It creates a new password when registering on a website and remembers it for later. For every address and credit card, you can create a profile to make an online purchase in just a few clicks. It offers smartphones and tablets apps with fingerprint support for secure access. Add another layer of security to your LastPass account through Two-factor authentication. The price for 1-100 users is $48/user/year and the price decrease as the number of users’ increases. 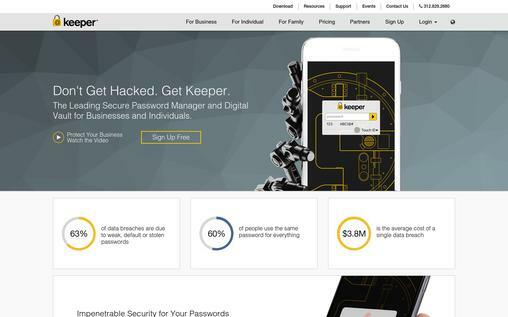 Keeper is one the leading secure password manager for businesses and individuals that makes managing passwords simple and intuitive. It auto-fills passwords across your apps, generates strong passwords, and organizes passwords on all devices and platforms. You can securely manage, store and share your digital assets with Keeper’s Cloud Security Vault. Keeper for business allows you to create, share and manage both encrypted folders and individual records across teams of all sizes. With KeeperFill you can quickly access websites by auto-filling login credentials for fast and secure access. Keeper works on your computer, smartphone, and tablet. And your records are automatically synced with all your devices. It supports fingerprint login, 2-step verification and Keeper DNA which confirms you identity by using your personal devices like smartwatch. It is a zero-knowledge security provider where KSI doesn’t have access to its user’s master passwords or their records stored in the vault. Only the users have full control over the encryption and decryption of their data. It costs $29.99/year for 1 user and $59.99/year for 5 users. 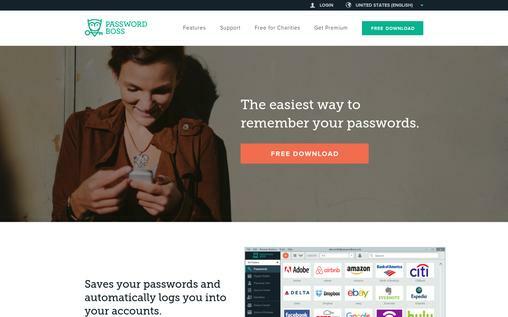 Password Boss offers one of the easiest ways to remember your passwords. 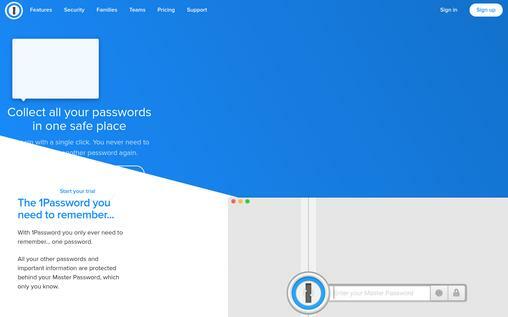 It saves your password and automatically logs in to your accounts. It saves all your important info in secure notes and helps you to quickly fill in online forms. Also, you can instantly share any date with your friends and family. It uses multiple layers of bank-grade security where you can access only through the master password and it’s never transmitted or stored anywhere. Easily sync your account across all the devices to access your passwords and personal data from anywhere. You can designate someone for accessing your account in case of an emergency. You can choose the information you want to use from the digital wallet and Password Boss auto fills the long online checkout form for quick and hassle free online shopping. You can quickly delete data from a lost or stolen device, without losing a backup copy. Get your security scores and receive an instant alert on security breaches. It uses 2-step verification to ensure unrecognized devices cannot access your account. You can use it for free or go for the pricing plan starting at $29.99/year. 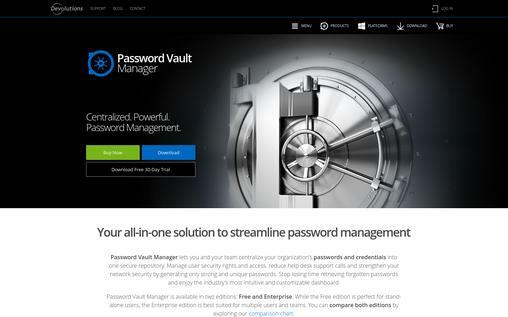 Password Vault Manager provides all-in-one solution to streamline password management. It is best suited for organizations and teams. It offers an intuitive user interface which is easy to use without any extensive training. Also, allows you to manage confidential documents as attachments or secure notes. It allows you to secure, store and organize your passwords into groups and folders. Manage your software keys, credit card and bank information, email account information and many others using one master password. Identify weak passwords and generate strong random passwords. You can import passwords and credentials from a variety of management tools including LastPass, 1Password, SpalashID, and many others. It offers team solutions by centralizing passwords and credentials into a secure repository and allowing you to share data with multiple users. It costs $59.99 for one-time registration and $29.99 for subsequent annual maintenance subscription. 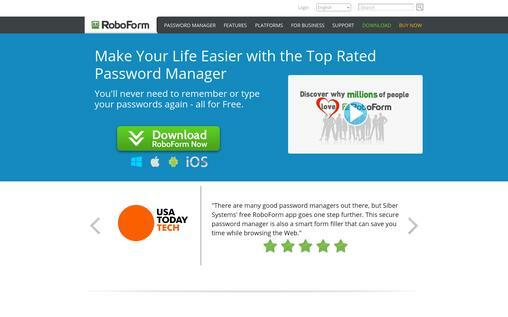 RoboForm is one of the top rated password managers which remembers your passwords and helps you to automatically log you in your favorite website with just one single click. It offers features like form filling, password generation, and SafeNotes. It works on Windows, Mac, Android, iOS and Windows Phone. The automatic form fill-up option is a great bonus if you love to shop online. It allows you to fill out those long and tedious web forms instantly with just one click. The Password Generator allows you to generate the unique and secure password by using different characters. You can securely access your passwords from your PC, smartphone, tablet or even USB drive. And it easily syncs your passwords across all your devices. It offers multifactor security option for an addition layer of security. The Search Box allows you to find logins, Safenotes, identities, and search on the web. It offers live phone support along with email support. It costs $19.95 a year for access to sync on all devices. Password Manager Pro is a privileged password management software for enterprises. It offers a secure centralized vault to store, manage and organize shared sensitive information such as passwords, digital identities, and documents of enterprises. You can automatically reset the passwords of databases, servers, network devices and other resources. Automatically login to websites and applications from its web interface. It offers role-based access controls that allow you to assign rights to the users to restrict them from managing stored passwords and resources. It offers two-factor authentication for logging in and encrypts the passwords and sensitive data using AES 256-bit encryption for extreme security. You get the provisions for both schedule and live backup of the entire database. And you can access offline even through mobile to retrieve passwords when there is no internet connectivity. It allows you to video record all privileged access to get a complete record of all actions for forensic audits. It offers comprehensive audit trails and reporting. 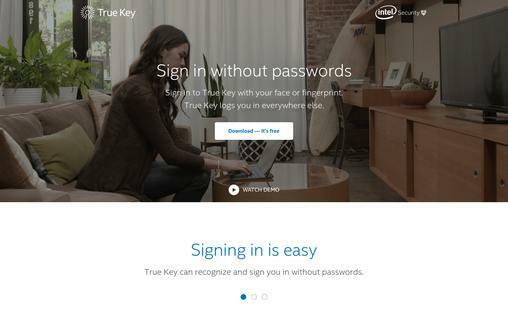 True Key is the ideal Password Manager for single users where you can sign in without passwords, with your face or fingerprint. It uses various verification processes such as face recognition, fingerprint or master password on trusted devices and two other preset factors when not using trusted devices. It auto-saves and enters your passwords It also allows you to generate a long and strong password which True Key app remembers for you. The True Key app recognizes the device you are using and notifies you if a sign is attempted on a device not trusted by you. It protects your password with AES-256 which is one of the strongest encryption algorithms available. Also, the passwords are accessible to you only and verified by multi-factor authentication before signing in. The Digital Wallet offered is very useful to store your credit cards, passports, Ids, and other sensitive info. You can access your True Key profile from your computer, phones and tablets and sync them easily. Get free storage of up to 15 passwords and if you need more then you can buy the premium plan for $19.99 per year for unlimited passwords. 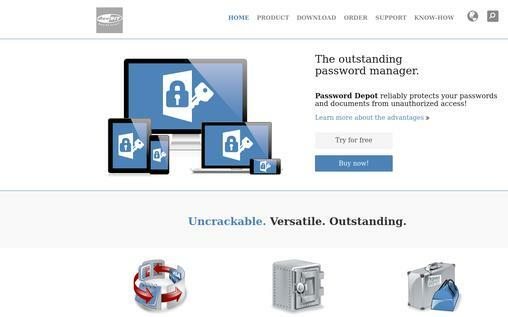 Password Depot is an user-friendly password management software that provides maximum security by protecting your passwords and documents from unauthorized access. It works on Mac, Windows, Android, and iOS. Secure your password files twice. You can select a master password and additionally, you can protect your data through a key file that can open the file when uploaded. Protection against Brute-Force Attacks – If a wrong login is attempted, the software is locked for 3 seconds which renders the password testing or “brute force attack” virtually impossible. The lock function locks your program based on your predefined locking condition to prohibited unauthorized access. It generates backup copies of your password files that can be stored on external hard drives or on FTP servers on the internet. You can define the interval of backup copies creation. You can get the full version at € 95. 1Password is an easy to use password management software that has an attractive and user-friendly interface. 1Password remembers everything for you to secure your digital life and it is easily available all the time. It never forgets your passwords and all important information like bank account routing number, Alarm code of your house etc. You can also use Tags to powerup your searches to find the information quickly that you are looking for. One master password to protect your all other passwords and important information. And your passwords are protected with a strong AES-256 encryption. You can login to 1Password through your mobile with a PIN code or your fingerprint. With the browser extension, you can integrate 1Password into your web browser to sign in to your online accounts, create passwords and fill in credit cards with a single click. You can sign in to supported apps like Safari, Tumblr, eBay, Twitter and more on your iPhone or iPad in a single tap, without typing your username or password. You can install this software on any number of devices with a single account or subscription. A digital wallet saves data like credit card and net banking details and can be accessed from any device. It costs $2.99 per month (billed annually) for one person, to be used on all your devices. Depending upon the type of usage, one can subscribe to any of the above mentioned services. All of them are highly professional and deliver comprehensive security solutions with world class standards. These software make one’s digital life much easier by eliminating the need to set and remember different passwords for different sites. We hope one of them suits your requirements.